Familiar with KanPlan app? Are you in need of a text based visual support for students or clients needing structured task lists without images and benefit from an interactive format? KanPlan app might just be the app to use. I first learned about KanPlan app last spring. It seemed to be just the right app for several of my students and now it is one of my favorite apps for scheduling or sequencing tasks for students who do not need images but still benefit from a step by step to do – done method of task completion. 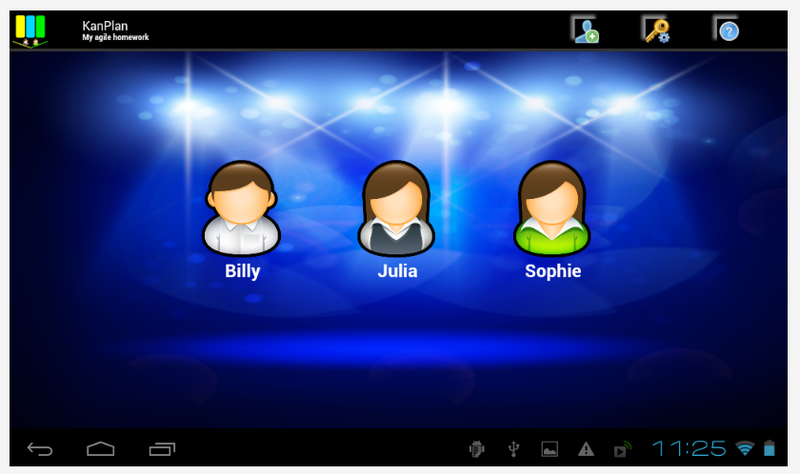 Easy to use, it provides text based information in a customizable, interactive and flexible format. I have been sharing the app with paraprofessionals and teachers/coaches and found after a brief overview of how to customize the app users have quickly and easily created a wide variety of visual task lists for students or clients serviced. I am amazed at how many tasks it can support and how easily individuals customize the app. 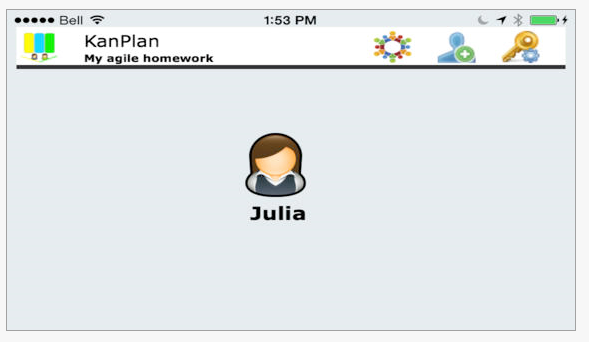 Although this app can be used for a single user, it can supports multi-users and can be set up for classes or families using a web-based task management system (See their blog for more instructions – http://kanplan.wordpress.com/ ). 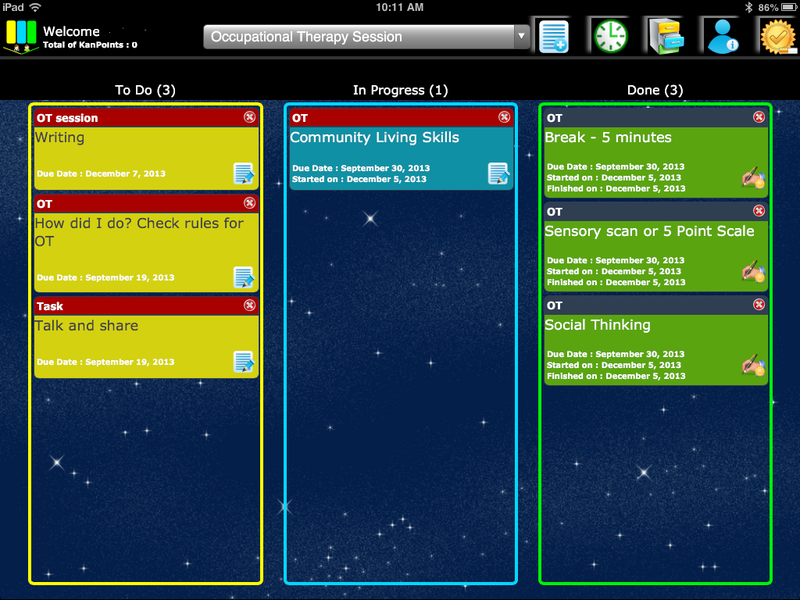 Multiple tasks can be created for each user. 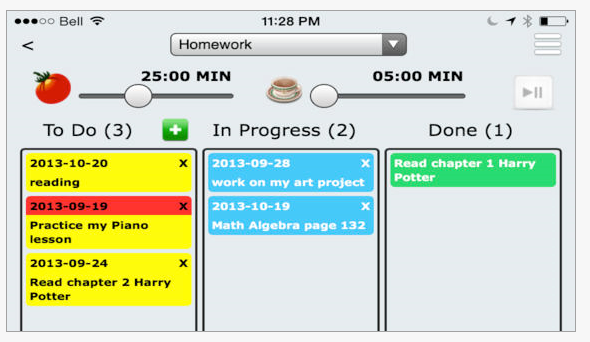 In the below image, the task “Homework” an example of a work task created with individual task created. The to do list tasks can be swiped or moved from the first column to the “In Progress” column and when completed tapped and moved to the Done column or list. Students enjoy physically interacting or moving the tasks from one column to the next. As an expanded “To do – Done” visual support, this seems to make this process concrete and interactive. A method of collecting points is available within the app which provides a method of collecting information or using it as a reward system if desired. 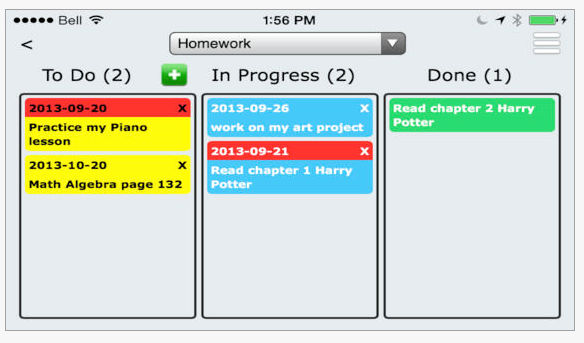 The changing of the colors of the tasks when moved to each column provide additional clarity with task completion. KanPlan app also provides the option to utilize a Pomodoro Timer. Different from the typically used visual timer, the Pomodoro timer is based on the Pomodoro Techique®, a specific time management concept of working with time (focused work for 25 minutes with brief break x4 then 20-30 minute break to aid time management and focusing abilities. Suggested to be good for ADD and improving time and prioritization management.). I use this with a student as a visual support that provides the student some choices of what order he might complete tasks within an OT session. There are some task I choose for the OT session but I also allow the student some choice of activities. One of the choices of tasks includes a break to allow practice with awareness and strategy choices of his self-regulation during an hour session. The same student uses KanPlan at home for his homework choosing what to work on first or last, consider time and priorities in his homework choices. A chore list also helps increase his independence with daily or weekly tasks. After a quick overview with a paraprofessional working with a mutual student who needed more structure during certain activities in Culinary Class, she created a specific list of tasks he was responsible for to be more productive. He is using an iPod Touch which is an accepted, portable tool for a high school student. Another list was created for tasks that needed to be done or reviewed for completion during a resource period. Further, an expanded task list of elements required of a writing project was quickly created as a personalized rubric to be more explicit in the requirements. The lists also help monitor at a glance the students progress with the tasks. Could these to do or task lists be done on paper? Of course they could, however for those students who are motivated by the use of electronics, consider it a more acceptable support or require numerous and quick customization of such lists, using an electronic device can reduce the paper chase and allow easy creation and editing. This app has many positive aspects but it is primarily for individuals who can read text. No audio recording or image supports are available within the app. I do wish there was an option of a standard timer along with the Pomodoro Timer to choose from. KanPlan app is available cross platform. KanPlan app for Android is free and 2.99 for iOS with compatibility with iPhone/iPod Touch, iPad . It is a great bargain for Android but also well worth the 2.99 for the iOS app. Have you used this app? Please share your experiences if you have! This entry was posted in Adults with LD, Android, App Reviews, Apps for OT's, Apps for Special Needs, Customizable app, High School, iADL's, iPad, iPhone, iPod, Life Skills, Middle School, Mobile Device Use, Occupational Therapy, Organization, School Based Interventions, Special education, Special Needs. Bookmark the permalink.